Polar Bear has lost his underwear! Where could it be? There's only one thing to do: Remove the book's underwear-shaped bellyband to find the missing pair! Is that Polar Bear's underwear? No, it's Zebra's—see the colorful stripes? What about that itty-bitty pair? No, those belong to Butterfly! And so the search continues, with every page revealing an animal in eye-popping undies. 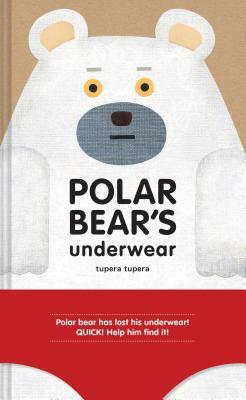 This laugh-out-loud, one-of-a-kind novelty book from Japanese design talents tupera tupera will surprise and amuse children and their parents, all while affirming the importance of putting on your underwear. tupera tupera is the Tokyo-based art and design firm of artists Tatsuya Kameyama and Atsuko Nakagawa. They are also the author and illustrator of Make Faces.